பிரபல பின்னணிப் பாடகி திருமதி.வாணி ஜெயராம் அவர்களுடன் பணிபுரிந்த போது தனக்கு நேர்ந்த சுவையான அனுபவங்களை எனது மாமா திரு.ராகவேந்திர ராவ் விவரிக்கிறார். Note: My Uncle Mr.A.Raghavendra Rao had an opportunity to work with Mrs.Vani Jayaram.He shared his hearty musings. I was as prosaic as a mule. Unfortunately, work was worship for me and not warship I clarify. Working more and more will lead us to speed and efficiency if not complete perfection, for “Perfection when reached, perishes,” Emerson said. I did not embrace any hobby. My colleagues who joined later stunned me with their amazing hobbies. In the group, we had a cartoonist Mr. M.S. Ramakrishna, a versatile singer Mr. GGK Murthy, a drum beater as well as a short story writer Mr. Raghuram and a critic Mr Krishna Murthy. The newly joined girls were singers and writers. They all chided me whenever I was free. In spite of this, I never had given a thought to acquire a hobby. All the girls called me younger brother while the boys called me daddy as I was younger than them, but senior in service having joined the bank early. With this, the climate was very congenial to work. Being senior they looked to me for guidance and in return they tried to display skills in their hobbies. Whenever transfers took place, it was customary for us to hold a farewell meeting in the Staff Canteen. While we munched some snacks, our chief (we would have called him ‘boss ’but he would not approve as boss in the movies represented the character of a villain) asked the lady employees to sing a few songs and they obliged. Then a few speeches appreciating the good performance of the ones would ensue. In the year 1967, one Ms. Doraiswamy Kalaivani was transferred from State Bank of India, Madras (Chennai) to Hyderabad Local Head Office. She was posted in our Department. She was not only beautiful and fair but also senior to all of us. She thus bagged a good desk to work. She was not garrulous like all of us. She was not even smiling at us. She was taciturn but silently worked hard. When she was around, we observed silence and her searching eyes, we felt, had some questions. Thus a month had passed by. One of the officers had been transferred on promotion and a party as usual was arranged. Lady employees sang a few songs. Our chief looked at Ms. Kalaivani and requested her to sing a song. She nodded her head and sang with her mellifluous voice Lataji’s famous number, “O Sajana… Barakha Bahaar Ayee…. Akhiyonme Pyar Laayee.” The song sequence was shot in the movie on Nutan in the film PARAKH. With the renewed request, she sang, “Ajaare Main To Kab Se Khadi Is Paar …..” again a Lataji’s number from the movie, “Madhumati” starring Dilip Kumar and Vijayanthimala, music scored by Salil Chowdhary. For a moment, we were all awe-struck at her voice as it was no different from Lataji’s in a tape. Whenever a function was arranged Ms. Kalaivani sang many Hindi songs though she hailed from Madras State (Tamil Nadu). Our enquiries revealed that she was the artist from All India Radio, Madras (Chennai). This news made the budding singers back away at subsequent farewell functions. At one of such farewell parties, when we finished our hot beverage, coffee, the chief asked her to sing a song. Everyone said so in chorus. When we were eagerly waiting as to which song she would select to render, she said, “I won’t sing. Why not others sing this time?” We disbelieved our ears as we confronted a “No” from her for the first time. And more so, she was a personification of excellent manners. The whole atmosphere of joy soon turned gloomy. Stony silence pervaded. After a few minutes, our chief touched my hands and asked me to come to their rescue. It should have been a joke and for the first time I cursed myself for being his Personal Assistant. In the officialdom, my brain worked faster and found almost possible solutions to the problems. But this was nothing less than taking me to the altar for beheading. However, to dispel the peculiar situation, I read out from my memory the lyrics of the only song I heard and heard in the radio in those days. The romantic song, “Yu Rooto Na Haseena Meri Jaan Pe Banjaati Hain, Meri Jaan Pe Ban Jayegi….” by Rafi Saab from the movie, NEEND HAMARI KWAAB TUMHARE, starring Shashi Kapoor and Nanda, music scored by Kalyanji Anandji. She smiled at me gracefully and rendered two songs and another one by way of a bonus. The changed climate brought cheers to all of us on that evening. The next day she approached my desk and told me, “ARR, I have a home work for you. You should listen to old, pretty old and new songs from 7.00 a.m. to 9.00 a.m. in radio Ceylon. If I choose any song from them and sing, you should point out errors.” What a punishment for me just because I came to the rescue of our chief the previous evening! I have no other alternative than to listen to the songs dutifully and intelligently escaped from the household chores expected of me from my family members. I used to have desk lunch in the office and attended confidential work. Ms. Kalaivani appeared during recess and pulled me to the record room nearby. My fears grew as the tests would begin. She sang even the latest songs. If I did not comment, she became serious and goaded me to listen again. Thus I was a listener by compulsion. Her voice had a magical effect upon me in due course. Ms. Kalaivani got married and was addressed as Mrs. Vani Jayaram. She was at her request transferred to Mumbai. She resigned her job later and took lessons in Hindustani music. The great movie maker Hrishikesh Mukherjee and Vasant Desai on a voice test found her voice as suitable for playback singing in Hindi. Thus she came to sing in the movie, Guddi in which Jaya Bhadhuri made her debut. Her songs, “Bolere Papihara Papihara….”and “ Humko Mann Ki Shakti Dena…..” turned out to be quite popular and made an indelible mark. Once she came to me and looked very much worried. “What’s the matter, madam?” I enquired. She told me, “ARR, I have tonsillitis.” “So what?” I questioned her. “See, I have also kerotese tonsils and I was advised by the ENT Specialist to undergo a minor operation.” “Operation!” she shrieked. “I don’t think I will ever undergo. I am afraid of my voice being affected. I shall see that I get cured by medicines only.” I admired her confidence in medicines while the surgeon told me operation being the only way to remove tonsils. I had my operation done and was back in a day. When I told her that everything went off well, she was happy. But she continued intake of medicines and her tonsillitis vanished after a few months. Words are not enough to praise this most versatile playback singer. Music makes audience spell-bound and no music touches the hearts of listeners unless supported by powerful and suitable voice. Composers though came out with various rhythms need a voice to reach the audience. While describing the classic Hindi film songs, Anirudha Bhatta Charjee and Balaji Vittal in their book, Gata Rahe Mera Dil, under the chapter, ‘Monsoon Melody’ paid encomiums to Mrs. Vani Jayaram when she debuted as a playback singer in Hindi films and the first song she sang was, ‘Bole re papihara, papihara’ in the film Guddi (1971), Lyrics written by Gulzar and music scored by Vasant Desai. Hrishikesh Mukherjee wanted Guddi to feature fresh talent. So, he cast Jaya Bhaduri, an FTII graduate, in the lead role with Bengali actor Samit Bhanja, who was not as well known in Bombay. The director wanted a new voice as well. “Look, I’ve signed on a new girl who is fresh from the FTII in Pune. And I want a fresh voice because the theme is like that,’ the film maker told Vasant Desai, who had been signed on to score the music of Guddi. Faced with the challenge, Desai recalled a conversation he had had with Ustad Abdul Rehman Khan of the Patiala gharana. The ustad had mentioned a young south Indian girl who was intelligent and had a good voice. She was a trained Carnatic singer and had moved to Bombay from Madras because her husband had been posted there as the executive secretary in the Indo-Belgian Chamber of Commerce and Industry. ‘You must hear Vani Jayaram,’ the ustad had said to Vasant Desi. Vani Jayaram started learning Hindustani music from Ustad Abdul Rehman Khan sahab who also taught Manna Dey, Mahendra Kapoor, Suman Kalyanpur and Sudha Malhotra. According to the singer, ‘The audition for this song took place at Vasant Desaiji’s place at Shivaji Park. Hrishi-da and Gulzar sahab were also present, and Hrishi-da decided to include me immediately. “Vani will sing all the three songs of Guddi”, was their unanimous verdict. Thus a new voice entered the world of Hindi playback. Vani continues, “The first song to be recorded was a Meera bhajan “Kaisi jiyoon ri mai Hari bin kaise jiyoon”, on 22nd December 1970. Pt Hari Prasad-ji played the flute in my very first film recording. The second song was recorded in April 1971. This was “Humko mann ki shakti dena.” Jaya-ji (Jaya Bhadhuri) came for the recording. The third song to be recorded was “Bole re papihara” in July 1971. Niyamat Kahan, aka Sadarang, was a court musician of the Mughal emperor Muhammad Shah Rangila. Considered a pioneer in the field of khayal, he is credited with any compositions. Of these, ‘Bole re papihara’, in Raga Mian Malhar, has been sung time and again by classical exponents like Ramakrishna Bua Vaze, Kumar Gandharva, D.V. Paluskar and Gangubai Hangal, Vasant Desai used this composition to create the universally loved film version. Desai’s composition ‘Jhir jhir barse saawani ankhiyaan,’ sung by Lata Mangeshkar and shot on Sumita Sanyal in her debut Hindi film, Aashirwaad (1968), was in Raga Gaud Malhar. The first two lines of the second stanza in this song, ‘Baawari birhan kal nap aye/pal beete jaise jug jaaye’ seem almost like the cue Desai wanted for the antara of his song in Guddi. Desai’s trusted associates were also involved in the creation of this classic. ‘Mr. Sebastian helped with the orchestration. Vasant Achrekar was on the table and the other percussionist was Lala Sattar. The sitar and sarod (the all-important string instruments for a classical raga-based score) were rendered by Jairam Acharya and Zarin Daruwala respectively. The flute was played by Sumant Raj-ji as Pt Hari Prasad-ji was not present on the day of recording. After the recording Hrishi-da remarked, “Don’t ask her how she is feeling. She is dazed.” Vani recalls. Album with no Mangeshi voice. ‘Hrishi-da shot the song at the Kanheri Caves in Borivali National Park (now renamed Sanjay Gandhi National Park) in Bombay. He took long shots of the caves and very deftly mixed the same with the close shots he had taken in the studios,’ says Gulzar, the film’s storywriter and lyricist. Guddi’s success was not just about ‘Bole re papihara. ‘Humko mann ki shakti dena’ became a prayer in almost all schools across India. For this song, based on Raga Kedar, Desai used the tune of the antara of his own Raga Behaag-based composition, ‘Tere sur aur mere geet’ (Goonj Uthi Sehnai, 1959), in the interlude to give the song the feel of a misra raga. The third number by Vani, the bhajan ‘Hari bin kaise jiyoonri,’ was taken out of the movie and replaced by Lata Mangeshkar’s ‘Aaja re pardesi.” ‘For a week the movie ran in Delhi with my bhajan but after that, I don’t know why, it was replaced with ‘Aaja re pardesi.” And the birthday party sequence in which Guddi sings this song, was reshot,’ Vani said. Unfortunately, Vasantji and Vani could never meet for another song. Vani Jayaram visited Hyderabad and our Bank in 1968. She asked for me and one of her friends guided her to me. I was busy and when she suddenly appeared in front of me, I felt I was dreaming. She enquired about my welfare. I told her, “I am happy that you became a playback singer but I could not improve myself in music. I bought the GUDDI film (Jayabhadhuri debuted) songs record and I am indeed proud of you.” She replied, “Do not lie. I still remember the song you sang on that day. And, she rendered the complete song, “Yu Rooto Na Haseena Meri Jaan Pe Banjati Hain….” in a low voice. She said she loved the Rafi Saab’s number and learnt by heart. It was a very nice gesture of her to have called on me. Thereafter, there was no stopping. She elevated herself and thus reached the pinnacle of perfection in the art of singing. 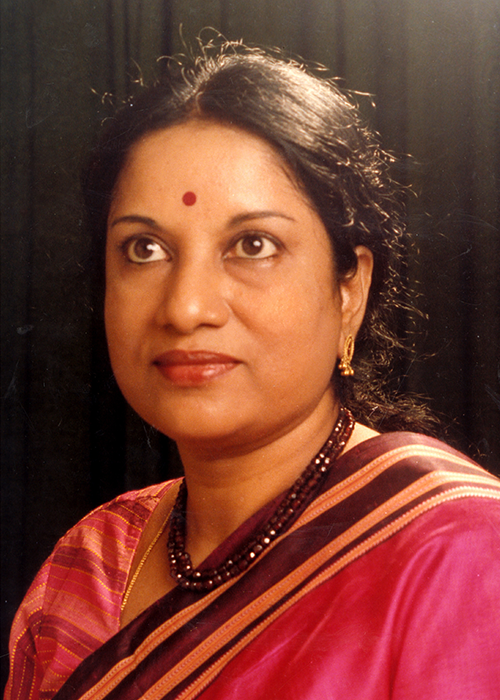 She thus rendered many songs in Hindi, Telugu, Tamil and Kannada. It was once our Branch Inspector on Mobile Duty noticed Mrs. Vani Jayaram at Delhi Palem airport lounge. He knew her when he was at LHO and introduced himself to her. While conversing with him, she asked, “Sir, do you know one red little chap who was in Local Head Office?” The Inspector being my close friend said, “You mean ARR, Madam? He is fine but now listening to the songs in the tape recorder and not through radio.” Now it came to my mind the perseverance of Abhishek Bachan, who is in love with Kareen Kapoor in the movie, “Main Prem Ki Diwani Hoon.” When the heroine asks him whether he knew how to ride a bicycle, Abhishek learns and rides and rides eternally. Unfortunately, I did not have the opportunity of either telephoning or meeting her after 1998. Yet she lived in my heart as her songs echoed often in my ears. Now she is one of the judges in the musical programmes in television channels and speaking chaste Telugu (the regional language in Andhra Pradesh). Our State Bank of India has produced the best of sportsmen, actors, cartoonists and singers who not only popularised themselves with their merit and acumen in their respective fields but also enhanced the image of the Bank. We are all indeed very proud of such a rare Institution.